Bring a part of Hogwarts home! From the wizarding world of Harry Potter, Funko presents this Albus Dumbledore POP vinyl figure! This wize wizard stands 3-3/4 inches. Check out the other Harry Potter figures from Funko!. Funko’s latest Harry Potter series features characters like; Bloody Baron™, Dobby™, Harry Potter™, Hedwig™, Hermione Granger™, Ron Weasley™, Rubeus Hagrid™, and Sirius Black™. Harry Potter™ stands approximately 3 ¾ inches tall and is packaged inside a window display box. Recommended Minimum Age: 3 years - small parts not suitable for children under 36 months. Look for new Pop! vinyl figures featuring characters from Fantastic Beasts: The Crimes of Grindelwald! This series of figures features; Albus Dumbledore™, Gellert Grindelwald™, Newt Scamander™, Pickett™, and Thestral™. Thestral™ stands approximately 3 ¾ inches tall and is packaged inside a window display box. Recommended Minimum Age: 3 years - small parts not suitable for children under 36 months. Explore the secret wizarding world of New York, seventy years before Harry Potter started at Hogwarts. From Fantastic Beasts and Where to Find Them, Newt Scamander as an adorable 3 ¾ - inch vinyl figure, perfectly showcased in a window display box. Look for new Pop! vinyl figures featuring characters from Fantastic Beasts: The Crimes of Grindelwald! This latest release of figures features; Nagini™ and Zouwu™. Zouwu™ stands approximately 3 ¾ inches tall and is packaged inside a window display box. Recommended Minimum Age: 3 years - small parts not suitable for children under 36 months. Great shape, never removed from box. Funko Pop Harry Potter: Nearly Headless Nick Vinyl Figure Item #30034. Condition is Brand New. Free Shipping. Funko Pop Harry Potter: Albus Dumbledore Vinyl Figure Item #5891. Condition is New. Shipped with Fed-ex. New, Has not been opened and pulled out before. The top may have the tape removed but the item has never been taken out. Funko Pocket Pop! Harry Potter Key Chain featuring Harry in his Hogwarts school uniform. Now you can take Harry with you everywhere! Collect them all!. Go back to the magical stories and adventure of Harry Potter and his friends with another great series of Mystery Mini vinyl figures! This series features Harry, Hermione, and Ron wearing a Sorting Hat. In addition, Bellatrix, Pidwigeon, Luna, Snape, and many more of your favorite Harry Potter characters! Mystery Mini figure measures 2 ½ inches tall and is packaged in a blind box. Listing is for only one vinyl figure. We cannot accept requests of a specific character and we cannot accept returned ones once opened. ✷ Figures are selected at random ✷ Recommended Minimum Age: 3 years - not suitable for children under 3 years. Even more Harry Potter greatness is coming! Introducing Harry Potter to Pop! Keychain blind bags. Miniaturized versions of some of your favorite Harry Potter Pop! vinyl figures can be taken on the go as Pocket Pop! keychains. It is a mystery which one you will get! Unwrap the blind bags to find different Luna Lovegood, Hermione, Dementor, Dobby, and different versions of Harry Potter! ✷ Listing is for only one (1) Harry Potter mystery keychain. Keychains are selected at random - we cannot accept requests of a specific character and we cannot accept returns once opened ✷ Recommended Minimum Age: 3 years - small parts. Funko Pop Harry Potter: Harry Potter with Marauder's Map Vinyl Figure #42. Condition is New. Shipped with USPS Retail Ground. Trending at $10.32eBay determines this price through a machine learned model of the product's sale prices within the last 90 days. Funko Pop Harry Potter: Nearly Headless Nick Vinyl Figure #62. New and unopened. Ships next business day. Showcase your love for the Wizarding World with figures from Fantastic Beasts: The Crimes of Grindelwald! Baby Niffler™, Pickett™, and Thestral™. Baby Niffler™ (Brown) stands approximately 1 ½ inches tall and is packaged in a window display box. ✷ Metal keyring is included ✷ Recommended Minimum Age: 3 years - small parts not suitable for children under 36 months. Funko Pop Harry Potter™: Bloody Baron™ Vinyl Figure #74. New and unopened. Ships next business day. Funko Pop Harry Potter™: Hedwig™ Vinyl Figure #76. New and unopened. Ships next business day. Harry Potter 01 is for sale. Window is creased and the back bottom right is a little cramped. Price has been adjusted for the box. Pop will be shipped with care. Newt Scamander has been shrunken down to the perfect travel size! Thie Fantastic Beasts and Where To Find Them character is a great addition to your backpack, keyring, or Funko collection. The Pocket Pop! Keychain measures 1.5 inches and packaged in a window display box. DISNEY POP! #10 Tinker Bell Diamond Collection HOT TOPIC EXCLUSIVE Glitter! DISNEY POP! #10 Tinker Bell Diamond Collection HOT TOPIC EXCLUSIVE Glitter! Condition is New. In original condition. Glitter FUNKO POP Series 1 . Shipped with USPS First Class Package. Will ship same day or next business day after receiving payment. Thanks for looking! 5 out of 5 stars - DISNEY POP! #10 Tinker Bell Diamond Collection HOT TOPIC EXCLUSIVE Glitter! 1 product rating1 product ratings - DISNEY POP! #10 Tinker Bell Diamond Collection HOT TOPIC EXCLUSIVE Glitter! Funko Pop Harry Potter: Harry Potter Vinyl Figure #1. Condition is New Never Opened. Trending at $10.25eBay determines this price through a machine learned model of the product's sale prices within the last 90 days. The Niffler has been shrunken down to the perfect travel size! Thie Fantastic Beasts and Where To Find Them creature is a great addition to your backpack, keyring, or Funko collection. The Pocket Pop! Keychain measures 1.5 inches and packaged in a window display box. 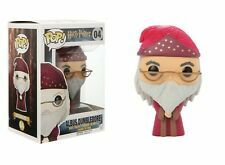 This is the Funko Pop Harry Potter: Albus Dumbledore Vinyl Figure #04. New and unopened. Ships next business day. This is the Funko Pop! Rick and Morty Pickle Rick Previews Exclusive #350. New and unopened. Ships next business day. Funko Pop Harry Potter: Nearly Headless Nick Vinyl. Condition is New. Shipped with USPS First Class Package. Funko Pop Fantastic Beasts and Where to Find Them: Newt Scamander Vinyl Figure. Condition is New. Shipped with USPS First Class Package. Trending at $9.80eBay determines this price through a machine learned model of the product's sale prices within the last 90 days. Perfect for all harry potter fans. Lucius malfoy looking as evil as ever. Box has some ware from storage but lucius is perfect. Showcase your love for the Wizarding World with figures from Fantastic Beasts: The Crimes of Grindelwald! Baby Niffler™, Pickett™, and Thestral™. Baby Niffler™ (Charcoal) stands approximately 1 ½ inches tall and is packaged in a window display box. ✷ Metal keyring is included ✷ Recommended Minimum Age: 3 years - small parts not suitable for children under 36 months. Look for new Pop! Character | Pop! Funko Pop Harry Potter: Harry Potter Triwizard Vinyl Figure. Condition is New. Shipped with USPS Priority Mail. Severus Snape POP! Funko figurine. Original unopened packaging. It is in perfect condition, and a great piece from Funko Pop. He is sporting his standard Hogwarts Robes, as well as his lovely wand that protects him throughout the series. Enjoy the magic of Hogwarts and stand up to "He who must not be named" with this Harry Potter - Albus Dumbledore Pocket Pop! Keychain. This vinyl keychain measures 1 ½ inches tall and is packaged in a window display box. Metal keyring is included. Recommended Minimum Age: 14 years - may contain small parts. Albus Dumbledore is the perfect size to add to your keyring or to a backpack! Recommended Minimum Age: 14 years. Enjoy even more Harry Potter fun with Funko Mystery Mini! Collect characters making their Mystery Mini debut, as well variations of characters currently in the Harry Potter Mystery Mini collection. This third series of Harry Potter features characters; Argus Filch, Cedric Diggory, Crabbe, Dolores Umbridge, Draco Malfoy (Suit), Fleur Delacour, Goyle, Harry Potter (Robes), Mad-Eye Moody, Mrs. Norris, Rita Skeeter, Viktor Krum. Each Harry Potter mystery mini vinyl figure measures 2 ½ inches tall and is individually packaged in a blind box. ✷ Listing is for only one (1) Mystery Mini vinyl collectible. Figures are selected at random - we cannot accept requests of a specific character and we cannot accept returns once opened ✷ Recommended Minimum Age: 3 years - small parts not suitable for children under 36 months.